A selection of republished corporate finance articles and book chapters that can serve as an advanced corporate finance supplementary text for courses that use no textbooks. 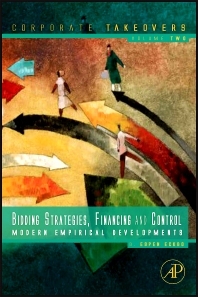 Combining convenience and an affordable price with retypeset pages and a high-quality index, the 600 pages of volume two, "Bidding Strategies, Financing, and Corporate Control", focus on a range of special topics, ranging from theories and evidence on strategic bidding behavior (offer premiums, toeholds, bidder competition, winner’s curse adjustments, and managerial overconfidence), issues arising when bidding for targets in bankruptcy auctions, effects of deal protection devices (termination agreements, poison pills), role of large shareholder voting in promoting takeover gains, deal financing issues (such as raising the cash used to pay for the target), managerial incentive effects of takeovers, governance spillovers from cross-border mergers, and returns to merger arbitrage. Including an index and new introduction, this volume will simplify and facilitate students’ interaction with new concepts and applications.